"Yahoo! Inc. (NASDAQ: YHOO) today announced that its Board of Directors, after careful review and consideration of how to best drive long-term value for shareholders, has unanimously decided to suspend work on the pending plan, announced in January of 2015, to spin off the company's remaining holdings in Alibaba Group Holding Limited (NYSE: BABA). The Board will now evaluate alternative transaction structures to separate the Alibaba stake, focusing specifically on a reverse of the previously announced spin transaction. "In the reverse spin off, Yahoo's assets and liabilities other than the Alibaba stake would be transferred to a newly formed company, the stock of which would be distributed pro rata to Yahoo shareholders resulting in two separate publicly-traded companies. "The reverse spin off is expected to require, among other things, third party consents, preparation of audited financial statements, shareholder approval, and SEC filings and clearance, including under the Investment Company Act of 1940. While the company intends to move expeditiously to complete the transaction, it is advised that complex transactions of this kind can take a year or more to conclude." Yahoo held a conference call at 9:00 a.m. Eastern Time today to discuss this announcement. A live webcast of the conference call was available through the company's Investor Relations website at https://investor.yahoo.net/events.cfm. According to Yahoo: "an archive of the webcast will be accessible for 90 days through the same link." 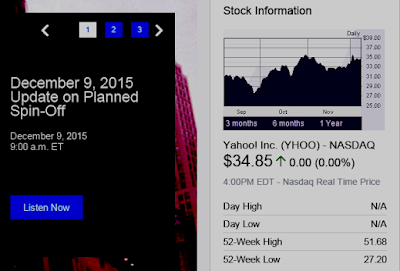 After the conference call, in early trading today, both Yahoo (NASDAQ: YHOO) and Alibaba (NYSE: BABA) shares were up. In an unrelated SEC filing today, it was disclosed that on December 4, 2015, Max Levchin notified Yahoo! Inc. (“Yahoo”) that he was resigning from Yahoo’s Board of Directors effective immediately, due to "his other professional commitments and demands on his time, and not due to any disagreement with Yahoo on any matter related to Yahoo’s operations, policies or practices." The size of the board will be eight directors going forward. SEC filings of Yahoo are here.